Submitted by mahoney on Sun, 02/24/2008 - 10:36am. 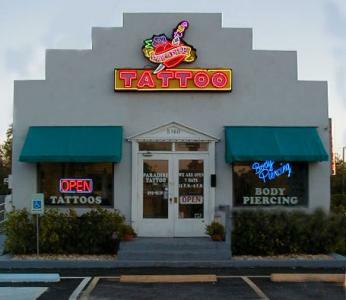 Tattoo and Piercing Parlors across the USA including Alaska and Hawaii...A tattoo, or dermal pigmentation, is a mark made by inserting pigment into the skin for decorative or other reasons. Tattoos on humans are a type of decorative body modification, while tattoos on animals are most commonly used for identification or branding. Tattooing has been practiced worldwide. The Ainu, the indigenous people of Japan, wore facial tattoos, as do some Maori of New Zealand to this day. Tattooing was widespread among Polynesian peoples, and among certain tribal groups in the Philippines, Borneo, Mentawai Islands, Africa, North America, South America, Mesoamerica, Europe, Japan, Cambodia, New Zealand and China. Despite some taboos surrounding tattooing, the art continues to be popular all over the world.